Latest housing data is yet another sign of the market picking up steam, as record-low mortgage rates have spurred demand for homes. 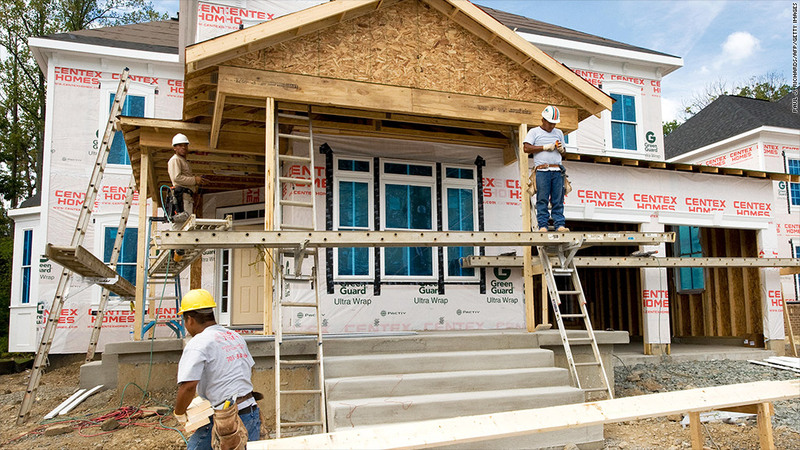 The pace of home building surged in December, as the market bounced back from the impact of Superstorm Sandy. Builders started construction at an annual pace of 954,000 home last month, the Census Bureau reported, up more than 12% from November's pace. That's a nearly 37% leap from December of last year. The reading smashed the 889,000 that economists surveyed by Briefing.com were expecting. The Northeast saw a 19% increase in housing starts from November to December, as construction picked back up again after the storm put a halt to new building activity. Single-family housing starts also boosted December's strong reading, rising more than 8% from November. Applications for new building permits, which are seen as an indicator of builders' confidence in the market, were little changed from November's rate. But the annual rate of 903,000 reported in December is up 28.8% from last year's level. Thursday's reading is yet another sign of the housing market picking up steam, as record-low mortgage rates have spurred demand for homes. A recovering job market and a tapering off of foreclosures have also given the market a boost. As distressed homes leave the market, that means that there are more buyers interested in purchasing fewer available homes. Home prices, in turn, have continued to rise, posting the biggest percentage gain in more than two years last month.